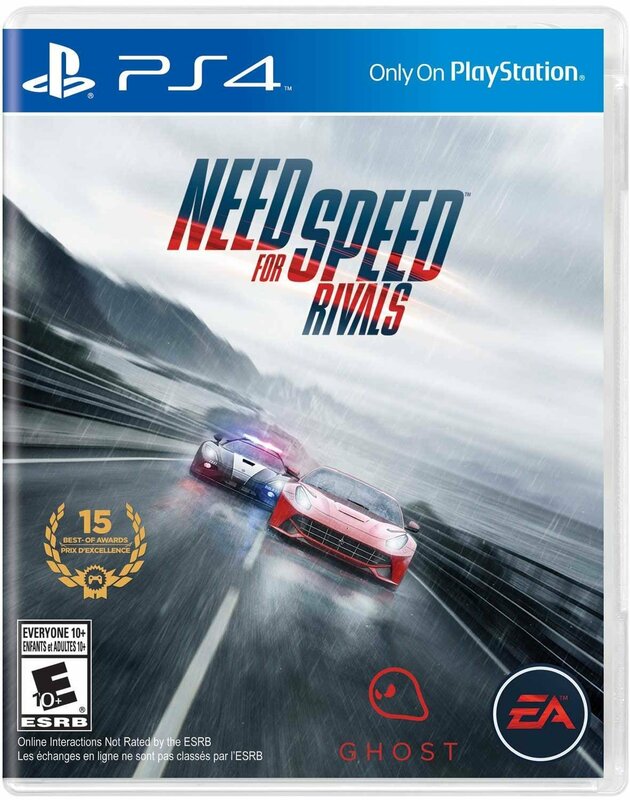 Need For Speed Rivals challenges your reaction times, satisfies exploration desires, and increases thrill tolerances in an amazing open-world racing game, the twentieth in the series from Electronic Arts. Developed by Ghost and Criterion Games, Need For Speed Rivals, blends the single and multiplayer modes into a seamless experience with endless progression possibilities, weapon abilities, and constant challenges. Players can easily advance as an illegal racer or law enforcement while keeping the foot to the floor or meticulously nab each detailed opportunity amid the dense environments set in Redview County. Special car weapons, chasing helicopters, and dynamic weather conditions all heighten the excitement as player progress by completing objectives and gaining SP points. All the points acquired in the multiplayer carries over to the single player so a sense of progression never stops with approximately 150 events. Redview County offers players amazing environments while the sharp 1080p graphics accommodate the fast paced gameplay. Players can be a racer or a cop with convenient abilities to switch between them very quickly. The cop career tracks includes patrol, enforcer and undercover and racers get race, pursuit, and drive. These tracks sets into speedlists where players can customize these three-item lists, which advance players through the game, but the list resets when changing so use some strategy to save time. Players can easily customize objectives to their preferences (lower difficulty, favorites, etc.) and even continue after career completions for even more bonuses. Racer events include pursuits, races, and time trials while cops get pursuits, rapid responses and interceptors. I loved getting many chances to help out other players escape from cops and vice versa. These special situations test speed and reaction time skills, but novices will definitely need some practice. Illegal racers compete against vigilant law enforcement amid varying scenarios. In the basic direct challenges, cops succeed by destroying the racer’s car or immobilizing racers for several seconds. Racers get “busted” and lose their SP points/progress from real players and AI vehicles, which occasionally includes some odd behaviors where a previously unseen threat suddenly appears or causes damage. Racers can make it to their safehouse and bank their SP points at any time. Cops have command centers. Both can drive through a gas station to repair their vehicle. It’s good to learn the map well since the environment cover over 100 miles (160 km), which is about the same size in Hot Pursuit and bigger than Most Wanted. The destructible billboards are gone in this new installment in the Need for Speed game series as this installment concentrates speed zones plus the familiar speed cameras and always entertaining jumps. The share option (pressing the share button on PS4 controller) is nice, but does not truly pause the game so the vehicle keeps moving while you take a screenshot/video then share capture content or start broadcasting gameplay. Not usually enough time for a cop to grab a racer, but still an annoying inconvenience in an intense game. Players can mute themselves. If you have the PlayStation Camera and don’t want other people in the All Drive hearing you, a quick way to “mute” yourself is to create a “party” with only you in it. You won’t be able to hear anyone else and no one else will be able to hear you. Now for the mode melding AllDrive system that combines single, co-op and multiplayer modes together so players do not have to switch among them. Players can easily connect with their friends and customize their status/exposure to other players. The dynamic weather system combines with day and night driving to create some amazing experiences that enhance overall gameplay. Unfortunately, sessions suddenly end then migrate when the host stops playing since there are not dedicated servers for this game. This migration typically lasts no more than a minute, but really hurts progression as players unfortunately lose hard-earned SP points. The special Autolog system began in the Hot Pursuit game installment and continues here with a nice progression system plus comparison statistics, leaderboards, and informational posts. The safehouse/garage lets players access several cars immediately, which is a nice component of overall gameplay. Each car includes five associated races. Players must progress to upgrade their vehicles among five different levels among these five categories: acceleration, control, durability, strength, and top speed. Upgrades fit the player progression model while pushing the competition and improvement elements. You really get a nice sense of the Need for Speed world where players can quickly improve and offer different challenges each time you encounter them in the game. Once your vehicles is ideal, then everything comes down to driver skills, especially problem solving in escape or capture situations. Players who are highly skilled…or just plain lucky can boost their reward by staying out in the field longer and risking more points before heading back to their respective bases. Captures or car wrecks can end the ride quickly and reset the score multiplier. The weapons, upgrades, and gadgets provide nice advantages and including electronic related wonders to hinder and knock out car function. Players can also progress to the point where they gain the ability to call in roadblocks. The whole map is available from the beginning of gameplay. Players on both sides gain advantages and points for risk taking. Racers should do pretty much everything that you should not do in real life in this game including drift, speed, jump, and drive against oncoming traffic. Proximity to other players also factors into the game reward system so be sure to check the smaller map circle in the lower left screen. The icons (overall map and lower left screen) are very helpful so players should memorize them. Press right directional button (see upper left icon) to open Easy-Drive menu, which offers endless action options plus lets players reset current events any time. Unfortunately this menu functions just like the PS4 controller sharing option where the car still moves and control is lost, so pull over to the side of the road if you are not in an open area. Crash animations are just shards and fragments with the base car intact. Role-playing elements do not directly involve any human characters. In Most Wanted you could see the car driver’s head more prominently, but you don’t in this installment…even during crashes. The physics feel (vibration) and look real as developers incorporate cliffs, dunes, and various ramps throughout the environments. The dynamic weather events really showcase the strong 1080p graphics as well as adding some variety to the environments. Helpful visuals icons include the health bar (middle top screen) as well as jumps (up arrow) and turns (green markings on the road). The Need for Speed Network mobile companion app (requires Origin log-in/association) allows players to still get in the game to “help or hinder”. For example the “Overwatch” mini game lets players gain fuel while playing away from their PlayStation 4. Also available on Xbox One, PlayStation 3, PC, and Xbox 360. This entry was posted in Video Game Reviews and tagged Michael Siebenaler, Mike Siebenaler, Need for Speed, PlayStation 4, PS4, Tall Writer. Bookmark the permalink.